﻿Bruce Goodman's "Derven’s pet guinea pig, Howard"
Derven’s pet guinea pig was called Howard. He’d named it after his uncle who was a skin specialist who walked around like he owned the place. Derven thought it was a fun name. Some people were very critical of this. It was insensitive to name a guinea pig after a renowned expert in skin. Many people suffered from skin cancer and a lot died from it. Anyway, what did Derven know about melanoma? He was a Nobel Prize Winner in Physics, not Medicine. His Ph.D. thesis on the influence of Charlotte Bronte on the writings of Dostoevsky was legend, but it hardly helped him know what was what with skin cancer. Just because he’d once read a book in Hindi on Egyptian hieroglyphics hardly turned him into a dermatologist. A quite large group of protesters formed and marched up the street. They demanded Derven’s head. 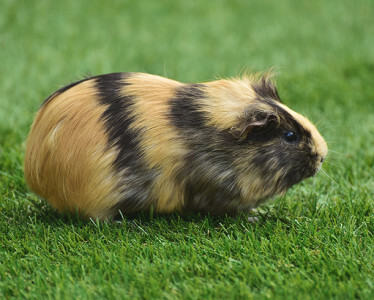 In despair for the horror of having named a guinea pig after his famed uncle, Derven committed suicide. The guinea pig starved to death. The protesters were very happy; they had saved the planet.